As I’ve been working in the garden and haven’t had the chance to go out in the field so am doing my birdwatching from the front deck. When I’m hot and tired from working in the garden and yard I take a break by sitting on the front deck and watching the birds at the feeder. The deck is even with the bird feeders which make it great for taking photos. 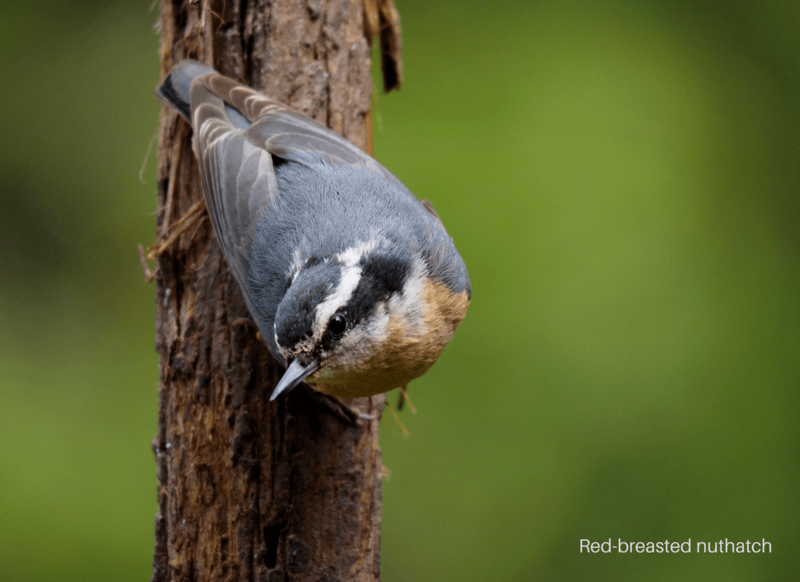 This is a busy time of year as the birds are either having young, feeding young or still nest building and the yard is alive with their activities. Last night we watched as one tree literally looked like it was quivering with birds as they flew in and out to the feeders. 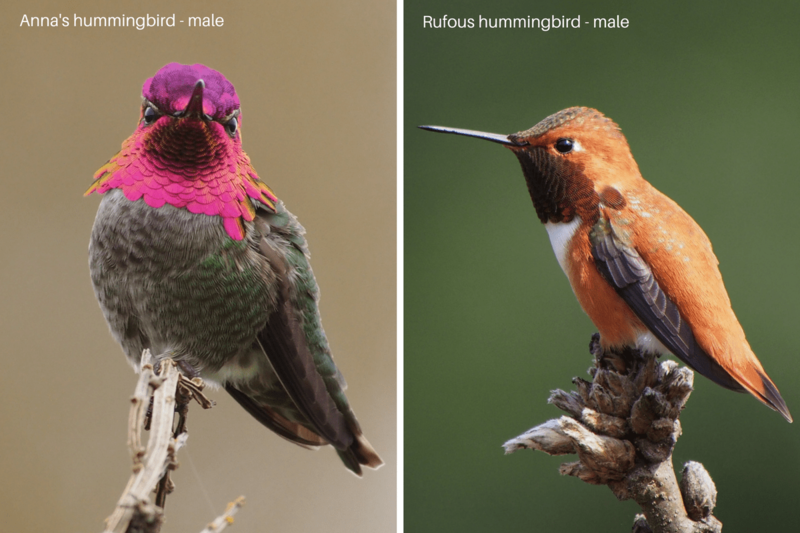 At this time of year, the hummingbirds rule the roost and divebomb any birds that get in their way or territory. 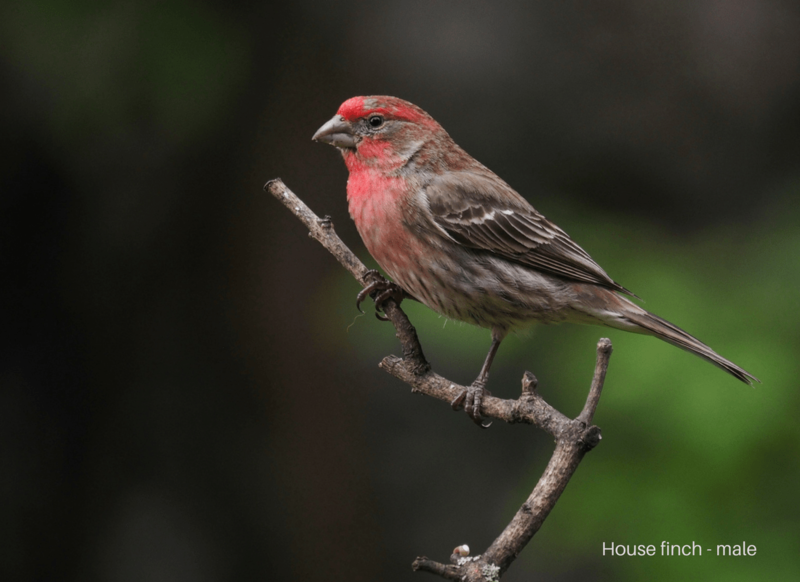 As the house finches have been using the hummingbird feeders, they are the prime targets. The hummingbirds that are currently in the yard are Anna’s and Rufous. Anna’s stay all year, but the Rufous only come in the spring and leave in the fall. I have three feeders out at different spots and at times, one of the males tries to claim them all. I don’t know how he has the energy as he so busy protecting he never has time to eat. With the high winds, the last couple of days some evening grosbeaks have dropped in on their way to their breeding grounds. 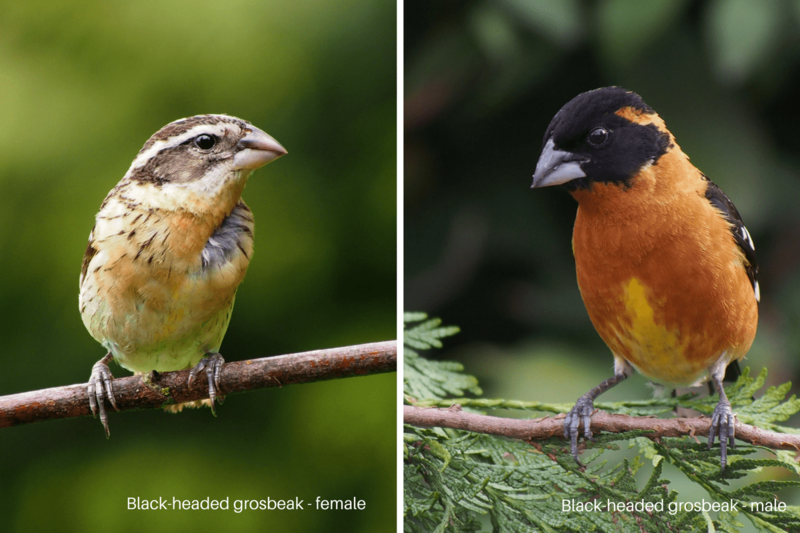 A pair of black-headed grosbeaks have arrived back and are making a nest. I’m assuming it’s the same ones that have been coming for the past couple of years. They are so jumpy and secretive that if I make a move in the house, they see the movement and immediately flee. None of the other birds take any to notice. 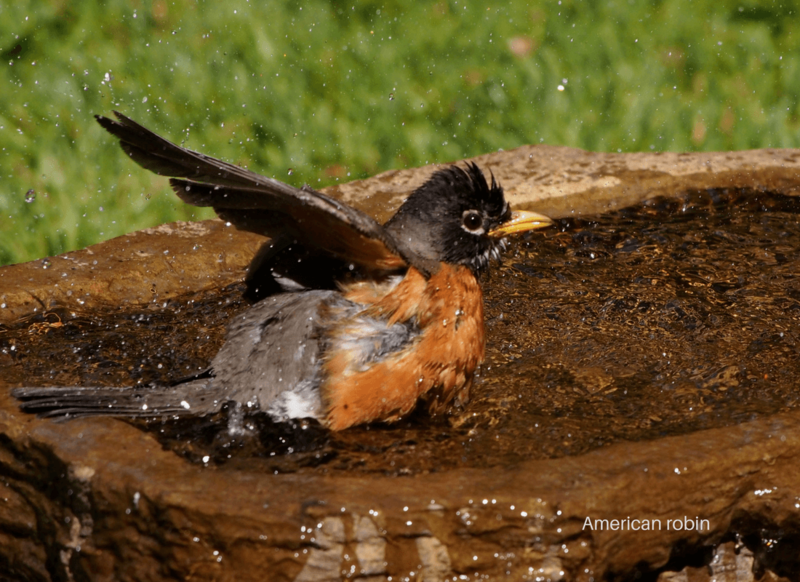 One of my favourite things to photograph is birds having a bath and especially robins. They love to bathe and you can just see the delight in their actions as they get right down into the water, head under and all. Besides food one of the main reasons I get birds in the backyard is water. I have had birds come in to drink and bathe but don’t stay to eat. This is especially important during a dry spell and you can see some unusual birds that you don’t normally find at your feeder visit the birdbaths. Just like the feeders needing seed, the birdbaths need fresh water every day. I clean them about every third day especially in the summer as algae form quickly or maybe more depending on how quickly the robins empty them of water. 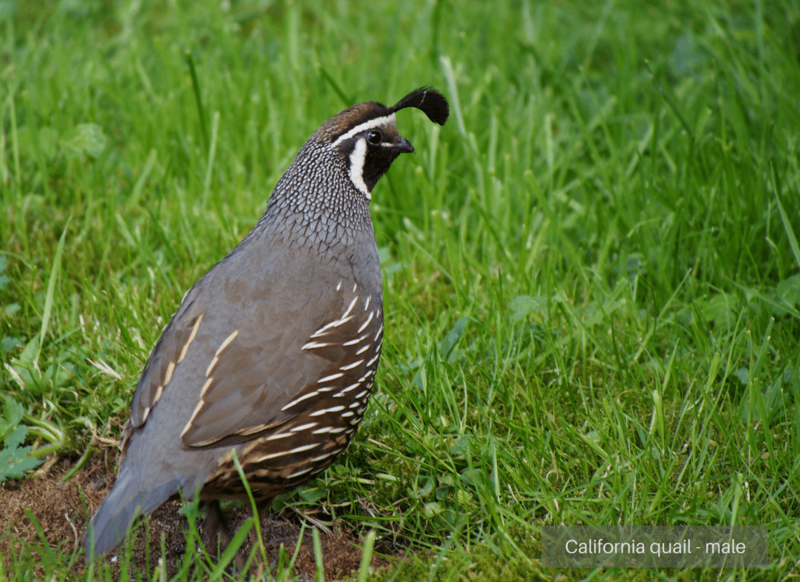 The California quail visit the bottom of the feeders competing with the squirrels for the dropped seeds. I’m waiting for them to have their babies and bring them around as there is nothing cuter than a baby quail. 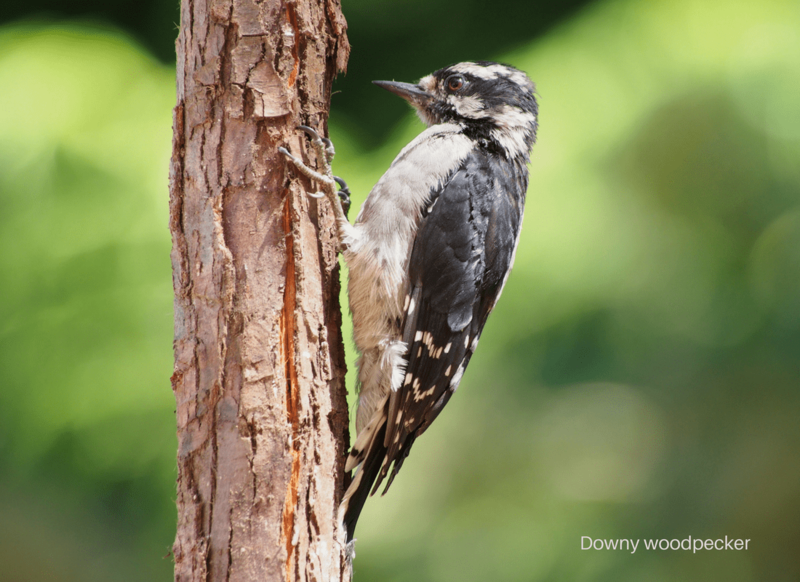 The downy woodpeckers are feeding their young as they are coming to the suet feeder, eating and then flying back to their nests with big chunks of suet in their bills. 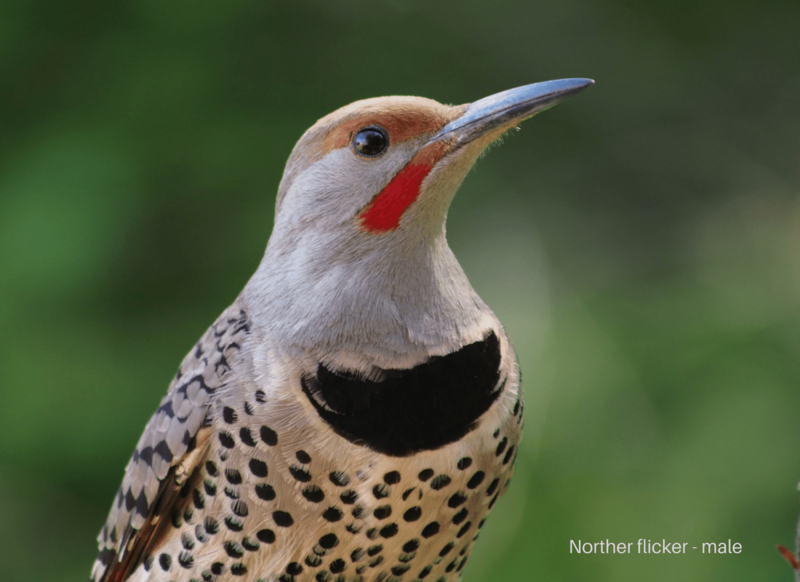 The northern flickers are still coming but not as often so I’m thinking they are probably still sitting on eggs. The house finches are feeding their babies who are shouting at the parents all the time for more food. They are so funny as they start to shake all over while anticipating the arrival of their next meal vocalising all the while. On a sadder note, there is one purple finch that is showing up at the feeder with a damaged eye. I’ve been asking around to see what the cause of it is and here is some feedback. 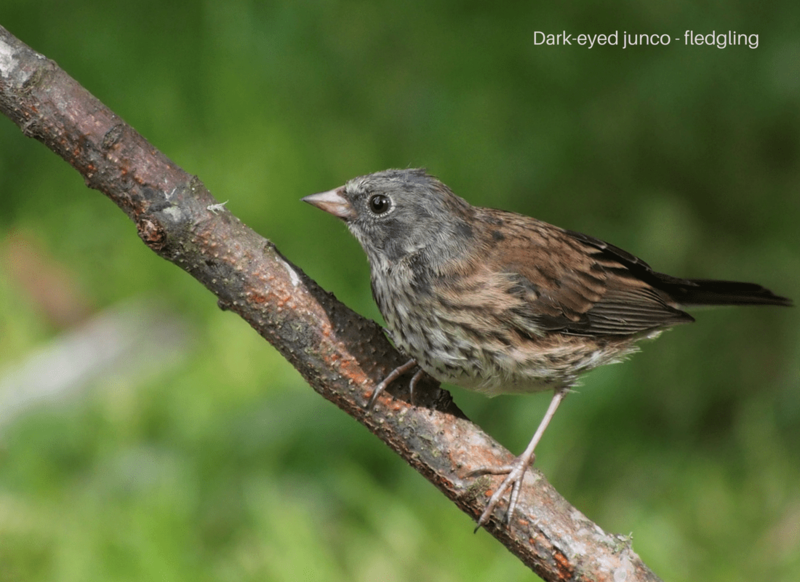 Conjunctivitis is common amongst house finches but uncommon for purple finches. I am trying to get a better picture as it almost looks like there are maggots around the eye socket. In the meantime, I’m keeping the feeders and birdbaths scrubbed clean just in case it is contagious. Nothing else has caught it yet, so I’m thinking it might have been an injury gone bad. 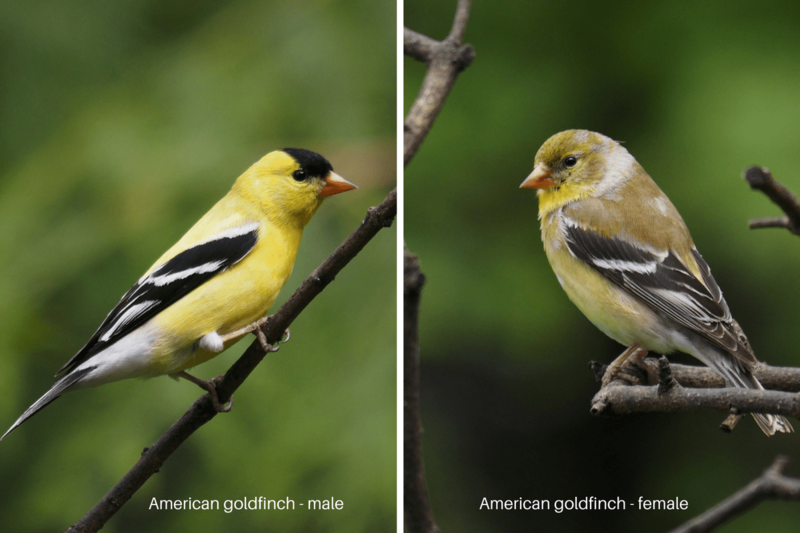 Along with the bright red of the house finches, there is the contrasting yellow of the American goldfinches. They make the feeders look so colourful with their bright yellow and gold feathers. In the past, I have put out niger seed for them but most of the seed that I got last year was rancid (look for the date on the bag) and I’m finding that the goldfinches are doing just as well on the sunflower seeds which are a lot less expensive than the niger. The pine siskins have quit committing suicide against my windows once I put a branch in front of it. Well, not just one branch, but a huge limb that stands on the ground and has multiple branches that reach the bottom half of the window. Easy to see through and the birds come and sit on the bare twigs. 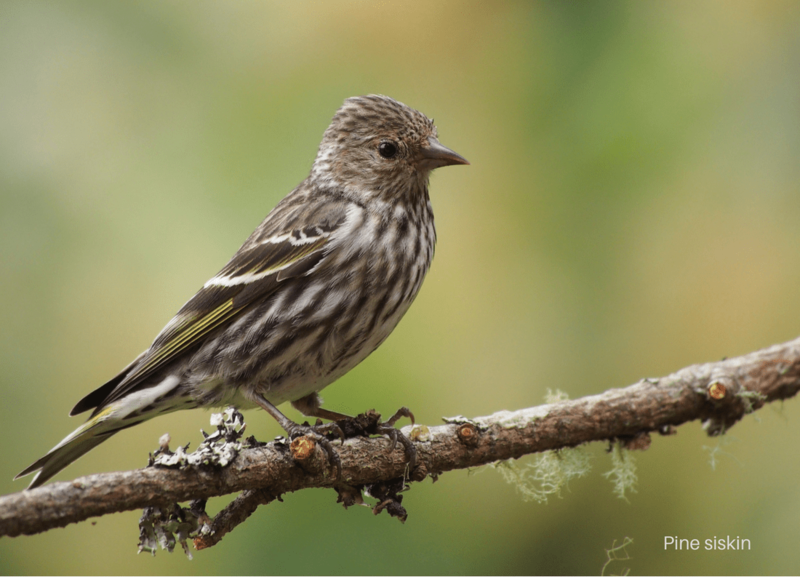 Before I did that, I was finding at least one pine siskin a day at the foot of the window. Don’t know why just them and no other birds but I remember someone saying to me that the reason that there are so many pine siskins it that they aren’t the sharpest knife in the drawer and there needs to be a lot of them just to keep the gene pool going. Just to note that I have bird stickers and other things in the window to deter birds from flying into them, but the branches seem to work a treat. As I type I am watching a little red-breasted nuthatch scurry upside down on its way to the suet. It just gets enough for one or two bits and then it is gone. 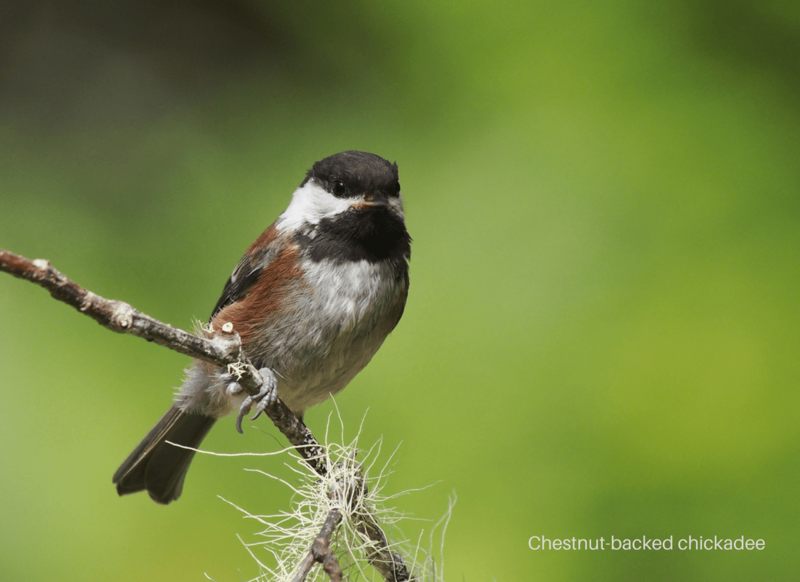 The chestnut-backed chickadees are here year round and are the most regular birds at the feeder. They grab a nut and then pound it against the branch to open it up. Seems to work for them. 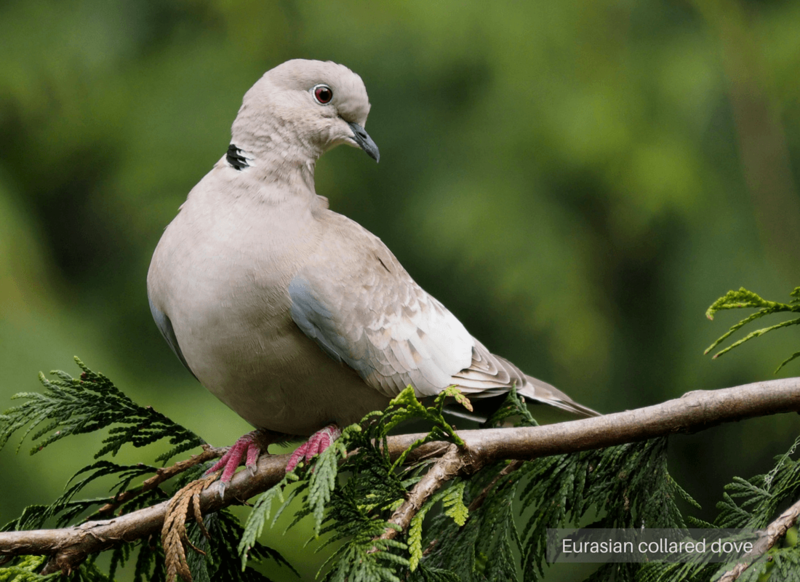 And who can forget the Eurasian collared doves? I call them the whoo whoo birds as they call whoo whoo (pause) whoo. 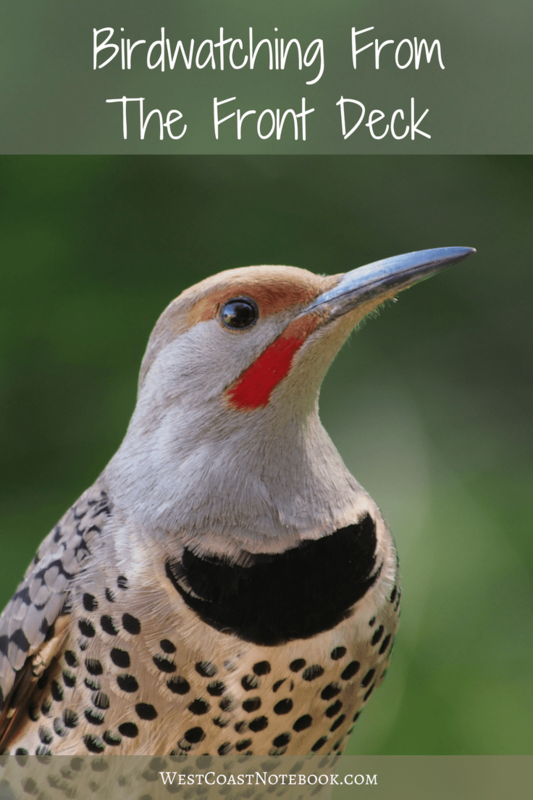 They are too big for the perches on the feeder so either feed on the ground or off the tray that catches the seeds at the bottom of the feeder. 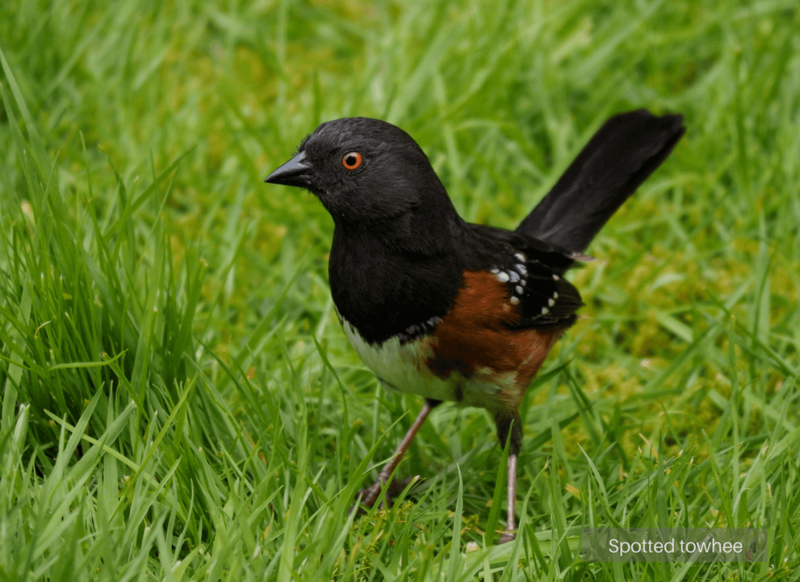 Yesterday there was a fledgling dark-eyed junco having a bite and a spotted towhee having a bath. Just another day in the backyard amongst the birds.